Back on November 15th 2013, San Francisco, California became "Gotham City" for a day. Because Batman and his trusty sidekick Batkid came to town. You may remember hearing about it, Miles Scott was a five-year-old cancer survivor, and he published a wish for the Make-A-Wish Foundation. The request read that Miles wanted to be Batkid for a day, and the request itself seemed impossible at the time. But when an onslaught of volunteers, businesses, city officials and countless others came together, they created to the most elaborate wish the foundation has ever achieved. It seems the city itself was affected just as much as Miles Scott. The film gives us an in depth look at Miles and his fight against cancer. It gives us a look at how the Make-A-Wish Foundation worked tirelessly to transform this wish into reality. We focus on Eric Johnston, an acrobat who helped "train" Miles for his big day. We focus on some of the big wigs over at Make-A-Wish who didn't realize that this special day for Miles would turn into a social media phenomenon. We see that the San Francisco mayor, their MLB team mascot, several cops on overtime and many more got involved. People flew for miles to just be there for Miles on his big day. Hans Zimmer who wrote the music for Christopher Nolan's Batman trilogy provided music for Miles' big day. So much effort and time went into this that it is so remarkably amazing. "Batkid Begins" is a big hug from a fluffy teddy bear. Its a feel good movie from start to finish, and I will admit that I was a puddle of tears at the end of it. I will say that I wish more time was spent focusing on Miles and his family, and how they reacted to the day. There is a moment at the very end of the movie where Miles' mom said that Miles had fun, but he had no idea why so many people were there to support him. With not much focus on Miles, this documentary looks like a bunch of grown-ups giving themselves big pats on the back, where I feel the film should be about Miles. There is a powerful moment when Eric Johnston brings Miles to a circus training camp, where Miles will "train" to be Batkid, and he lights up like a Christmas tree seeing the staff dressed as superheroes. He believes they really are superheroes and that superheroes train themselves. Its the best moment in the entire movie. But when the big day comes, it seems Miles is more overwhelmed than excited, his mask slips over his face more times that I can count, and before the day is over Miles is ready to be done, with his father having to talk him into finishing it up. I work with four and five year olds, and I can tell you with all honesty that any of my kiddos would have been absolutely overwhelmed by this. I can also tell you, they wouldn't get what all the fuss was about, and most of them would be turned off by a lot of this. And if they were sick, they would not be able to comprehend why thousands of people came to support them. While I think its was a great idea, and I glad Make-A-Wish went above and beyond on this little wish, I think the tone of the film is off. When the film focuses on the adults giving themselves mental high-five after mental high-five, it becomes a little to self-congratulatory. For a company that prides itself on being completely selfless, there were moments in this documentary where they all come off selfish. But I still can't get over what they were able to accomplish, and its tough not to cheer for them in this big, broad, feel-good movie. This is designed to tug your heartstrings, and it does, it definitely worked on me. I also think that something very relevant is discussed when they start talking about how San Francisco hit a huge high after the day, how everybody was nicer because of it, and how being a little childish and immature is actually good for us adults. Sometimes, I do think its okay to be a kid sometimes, and to take life so seriously. I think the world learned that on that day, and its a relevant topic to bring up. But I wanted to learn more about Miles and how the day affected him. Not some circle-jerk of adults who wanted to boast about what a great job they did. 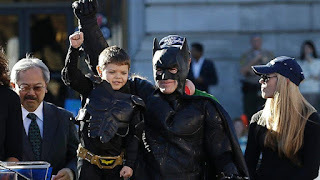 "Batkid Begins" is like two parents making a party for their child, but instead of asking what their child wants, they go with their gut on what they think the child will want. Its a moving, moving documentary, but I think it could have been much better if it was a little more honest and insightful.